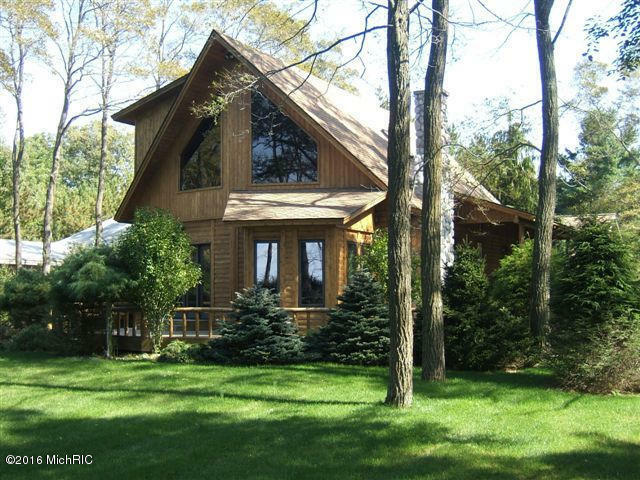 Private drive leads to custom built home with 100' of LAKE MICHIGAN waterfront. Warm and welcoming with that "Up North" feel best describes this well built home. 3 bedrooms, 2 baths, open floor plan with cathedral ceilings. Private master suite with sitting area, study and bath. Lower level has office and project room w/ skylights and is attached to oversize garage. Private Park Like setting off the road on about 2.4 acres. Year round spectacular views. Beautiful sandy beach at the lake.is within a mile of the Old Channel Trail Golf Course, The Old Channel Inn (a popular local restaurant), the White Lake public boat launch and the White Lake Channel.